We have a Western bean cutworm moth pheromone-trapping network that monitors this pest across the state. Western bean cutworm moth captures increased dramatically this week. We had 4101 moths caught this week as compared to 332 last week across the state. 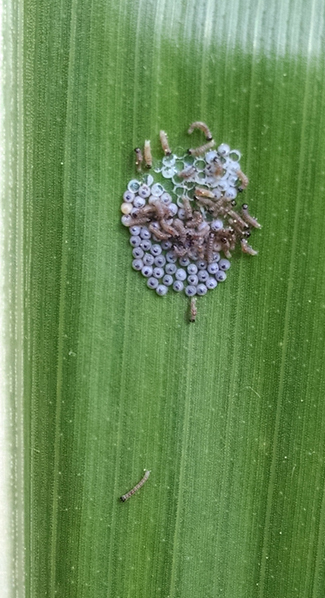 Start scouting your pre-tassel corn for egg mass and small larvae. There have been reports of Western bean cutworm over threshold and will need to be sprayed. For more information see below. There are still reports of potato leafhopper over threshold in fields across the state. Many of the fields have nymphs, which do more damage than the adults do. I was in a new seeding that was above threshold for potato leafhopper this week. About 90% of the plants showed potato leafhopper burn. Once the plant has leafhopper, burn there is a dramatic loss in quality and yield. There were reports of downy mildew on soybeans this week. Downy mildew is a common disease of soybeans and rarely causes yield losses. This disease proliferates under high humidity and cool temperatures. The fungus can overwinter on last season crop residue and can the transmitted by seed. Fungal spores are transmitted to the plant by wind and rain. When conditions are right the disease can spread quickly through a field. 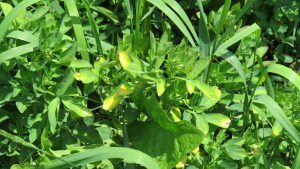 If the seed was infected with downy mildew the seeding will also be infected. 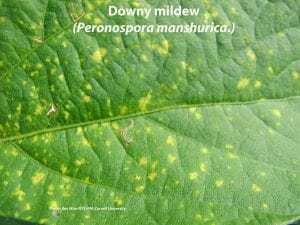 Downy mildew is a biotrophic organism. This means that the disease can only grow and reproduce in associated with soybeans. The disease can have rapid genetic changes in response to the genetic changes to the soybean plant because of this close relationship. There are many different races of this disease and it is monitored closely when new cultivars are being bred. Use certified disease-free seed. If you use seed that is not certified are saved seed from your previous harvests many contain the pathogens we discussed earlier. Use resistant cultivars; ask your dealer how cultivars compare for disease susceptibility or resistance and productivity. Make sure the cultivar is suitable for your specific region of the state. Use a fungicide seed treatment at planting. This will kill pathogens that might infect the seed at planting. If you are organic make sure the soil temperature is over 500 This will allow the soybean to grow quickly and avoid pathogens in the soil. Plow infected residue under the soil surface. This will help reduce the amount of disease laying on the surface that can infect the next crop. There were more reports this week of True armyworm being found in cornfields across the state. Armyworm issues should end soon as the corn gets taller and armyworms pupate and will no longer feed. Last week temperatures were near-normal to 4 degrees above-normal. Precipitation has ranged from less than ¼” to over 4”. Base 50 growing degree-days ranged from 90-170. Moderate drought and abnormally dry conditions expanded in northern NY. Dryer, less humid conditions before unsettled weather returns. Today will be mostly dry after a long stretch of wet weather exits the state; temperatures will be in the mid 70s to mid 80s with lower humidity. Western NY will have afternoon showers and thunderstorms ahead of a cold front, with the possibility for severe weather (damaging winds and locally heavy rain). Overnight lows will be in the low to mid 60s. Friday highs will be in the 70s and 80s with scattered showers and thunderstorms due to a frontal passage; there is a slight chance for severe weather (damaging wind, small hail). Overnight temperatures will be in the mid 50s to low 60s. Saturday temperatures will be in the 70s to mid 80s with scattered afternoon showers. Overnight temperatures will be in the mid 50s to low 60s. Sunday highs will be in the mid 70s to mid 80s with mostly dry conditions. Overnight temperatures will be in the mid 50s to low 60s. Monday temperatures will be in the 70s to low 80s with scattered showers and thunderstorms. Overnight temperatures will be in the 60s. Tuesday highs will be in the 70s to low 80s with scattered showers and thunderstorms. Overnight temperatures will be in the 60s. Wednesday possible scattered showers and thunderstorms with highs in the low 80s. Overnight temperatures will be in the 60s. The seven-day precipitation amounts will range from half an inch to over two and a half inches. The 8-14 day outlook (Aug 2-8) favors above-normal temperatures and above-normal precipitation for all of the state. Western bean cutworm trap catches took this past week with 10X as many moths caught this week than last. Higher moth captures more often found in western and northern county than southern or eastern locations. See summary table below. As trap accumulations approach 100 moths per traps risk of WBC infestation increases and field monitoring for egg masses and young larvae is recommended. NOTE: Sometimes traps do not indicate what is in the field. You should scout all fields even with low trap captures. Pre-tassel corn is the preferred host for egg laying WBC moths. Egg masses will be laid on the upper surface of leaves close to emerging tassels including leaves in the whorl. 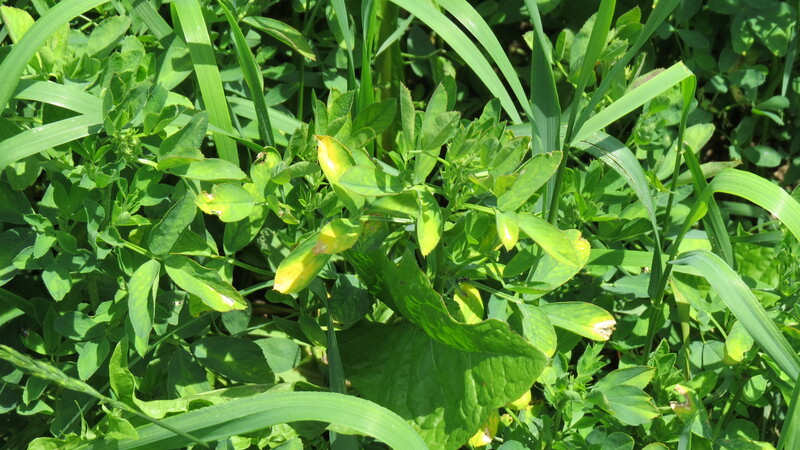 Check 10 – 20 consecutive plants in at least 5 random locations in the field. Threshold for field corn is 5% of plants with WBC egg masses. Egg masses are typically laid on upright leaves or those just beginning to lay over. I usually check top 4 leaves. If leaves are oriented towards the sun you can see the egg masses better on the top side of leaf or if looking at the bottom surface of leaves look for a shadow of an egg mass on the upper surface of the leaf. WBC eggs take ~5 – 7 days to hatch turning purple 1 – 2 days prior to hatch. Newly hatched larvae initially feed on their egg case and then make their way to silks or ears. If suitable food sources are not found the larvae will starve.